Always actively supervise children in and around water. Don't leave, even for a moment. Use barriers to keep kids away from water when you're not around. Never prop open the gate to a pool barrier. Don't leave toys that could attract children in or around a pool. Know where the manual cut-off switch for the pump is in case of emergency. Consider installing an approved .safety vacuum release system. (SVRS), a tool that quickly and automatically turns off the pump (and stops the suction) when something is trapped in or blocks the drain. Always wear U.S. Coast Guard-approved personal flotation devices while on boats, in or near open bodies of water or participating in water sports. 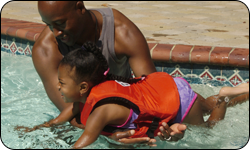 A PFD should fit snugly and not allow the child's chin or ears to slip through the neck opening. Air-filled swimming aids, such as water wings and inner tubes, are not safety devices and should never be substituted for PFDs. Make sure children take swimming lessons when they're ready, usually after age 4. Check with the local department of parks and recreation or Red Cross chapter to find a certified instructor, and look for classes that include emergency water survival techniques training. 44 states have laws that require children to wear PFDs while participating in recreational boating. The U.S. Coast Guard has also issued a rule requiring children under 13 to wear PFDs on board recreational vessels on Coast Guard waters. The rule applies to states without PFD laws. Recreational boats must carry one properly sized, U.S. Coast Guard-approved PFD, accessible and in good condition, for each person onboard. Don't let children dive into water less than nine feet deep, and no one should dive into a river, lake or ocean.